We are fully into the holiday season! Christmas is almost here and then New Year’s Eve is just around the corner. I could not be more excited! I love basically this entire holiday season, but there’s something special about NYE. Call me cheesy but I love that the holiday is centered around new beginnings and resolutions. It’s also such a great time to celebrate with friends and loved ones as you look back on the previous year. 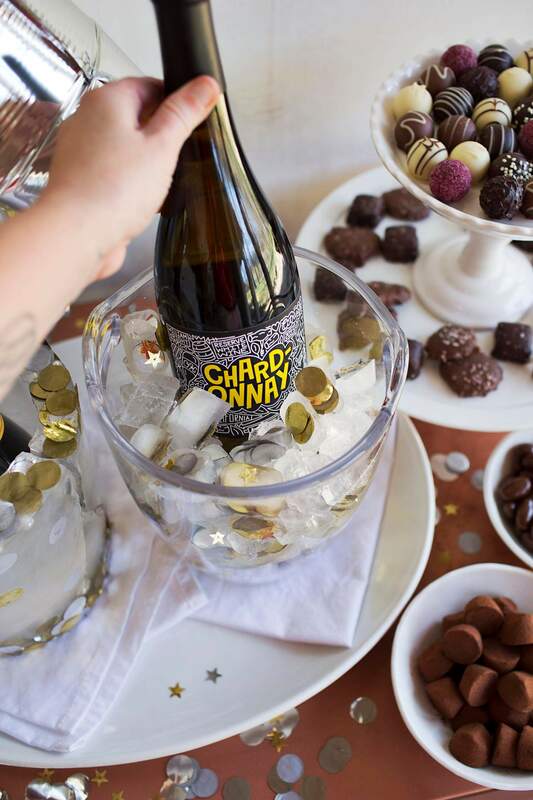 I wanted to share a couple of hosting ideas for a wine (and chocolate) bar, specifically about keeping chilled wines cold while still looking cute. In case you want to know what I specifically stocked my wine bar with, here it is: Belletti Prosecco, Coastal Cove Sauvignon Blanc, Dancing Flame Red Blend, William Wright Reserve Pinot Noir; plus a few special edition William Wright Cabernet Sauvignon, Red Blend, and Chardonnay (those last three are the ones that have the cute black and white graphic design look on the labels), created in partnership with designer Timothy Goodman and available in select ALDI stores this December! 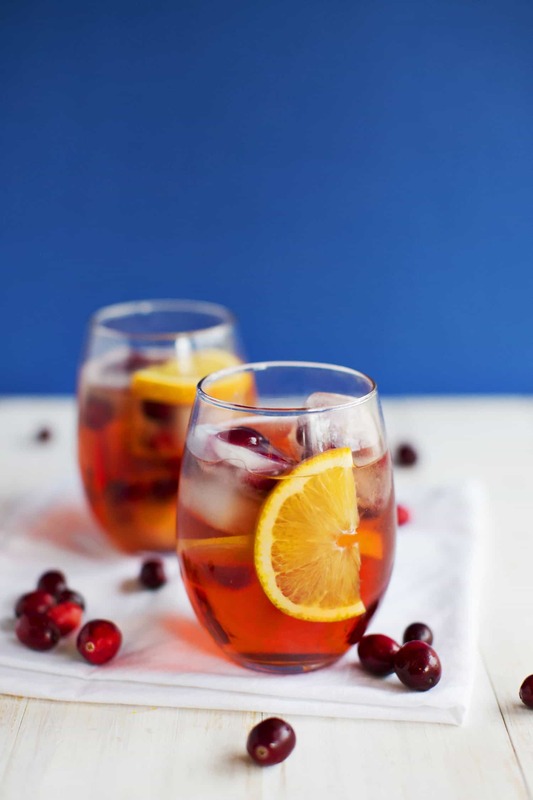 For red wines, they don’t need to be served chilled, and they are super easy to have on hand for a party. Just open an hour or so before the party so they can breathe and you’re basically good to go. But I’ve always thought wines that require refrigeration (so they can be served chilled) are a bit tricky at a party. Mainly, if they are tucked away in your refrigerator, sometimes it’s hard to remind guests that’s where they are. After all, sometimes people feel a bit odd just going through your refrigerator. 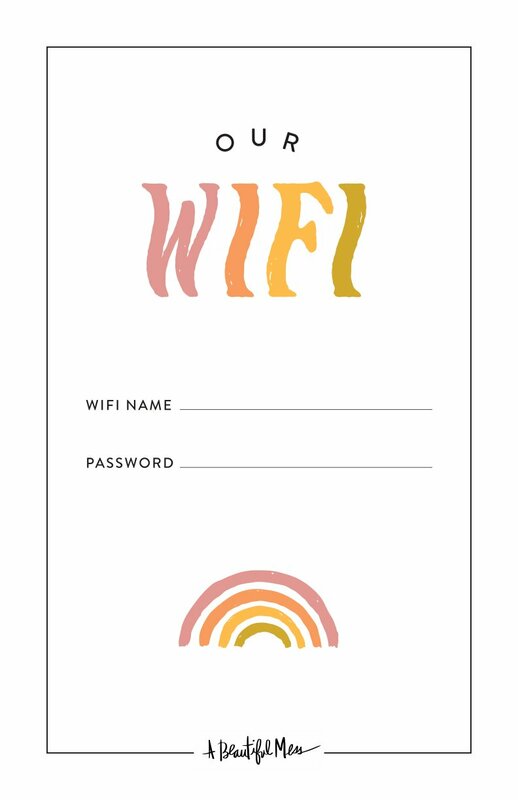 Plus there’s the whole “out of sight, out of mind” issue, so it’s possibly guests may not know you have chilled wines and then it becomes your job all night to remind them. 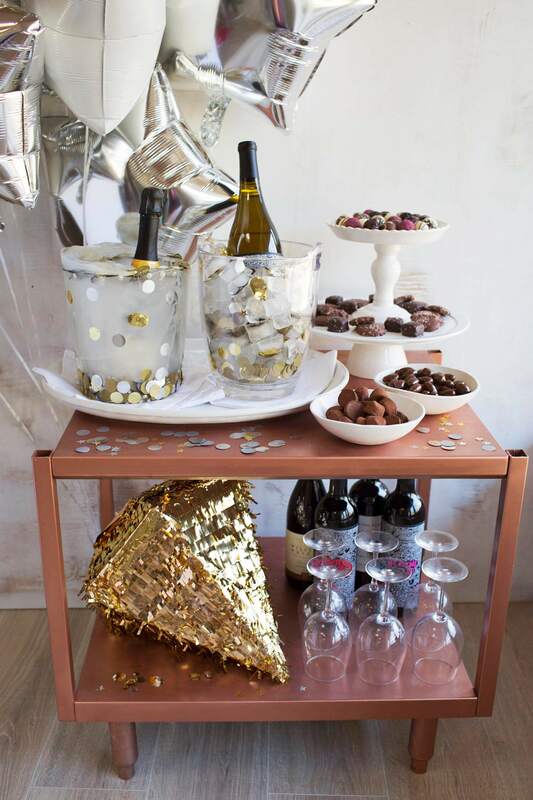 Which I don’t know about you, but I’m not a good enough hostess to remember to do that once a party gets underway. Wouldn’t it be better if the chilled wines could somehow sit out on a table or a wine bar while looking cute but still staying cold? Good news, I’ve got two methods to recommend to you—both super cute and effective, but one is much easier than the other. 😉 Plus, who doesn’t like options? First, I wanted to see about the whole solid ice bucket thing. I’ve seen these in magazines before, but I was curious how easy they were to make and how long they might last once they were sitting out (like they would be for a party). 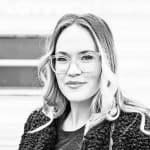 So here’s how I made one along with tips and thoughts for you. 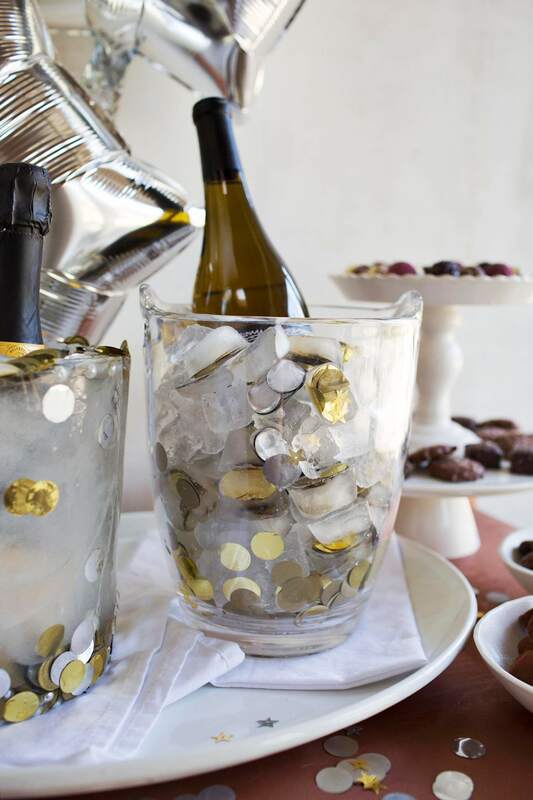 What you need in order to create a solid ice bucket is two containers, weights (or rocks), and whatever you want to use in the water to make the bucket look pretty. For my larger container, I used a (new, cleaned) plastic trash bin. And for the smaller container, I used a plastic cleaning wipes container (I cleaned it out and removed the paper label from the front). 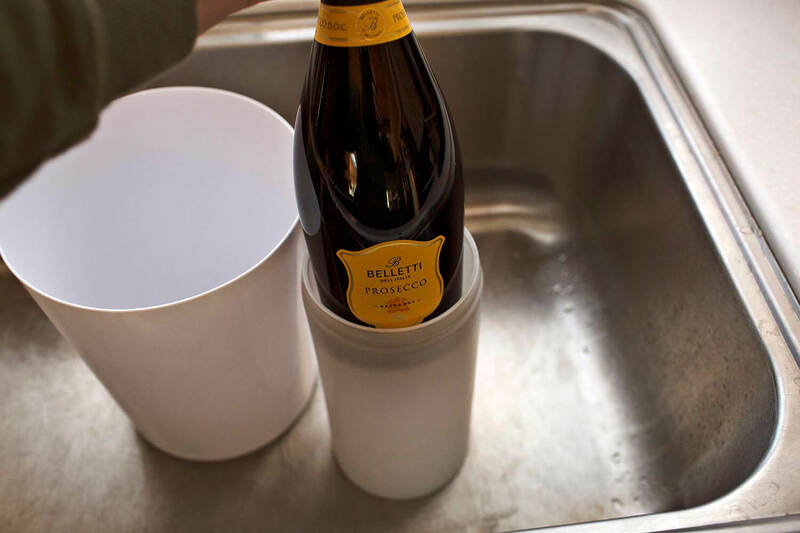 You want to make sure that your larger container will fit easily in your freezer, and also make sure that your smaller container is still large enough that the wine you plan to serve fits inside. Fill the smaller container with your rocks/weights (so it will not float) and set this inside the larger container. 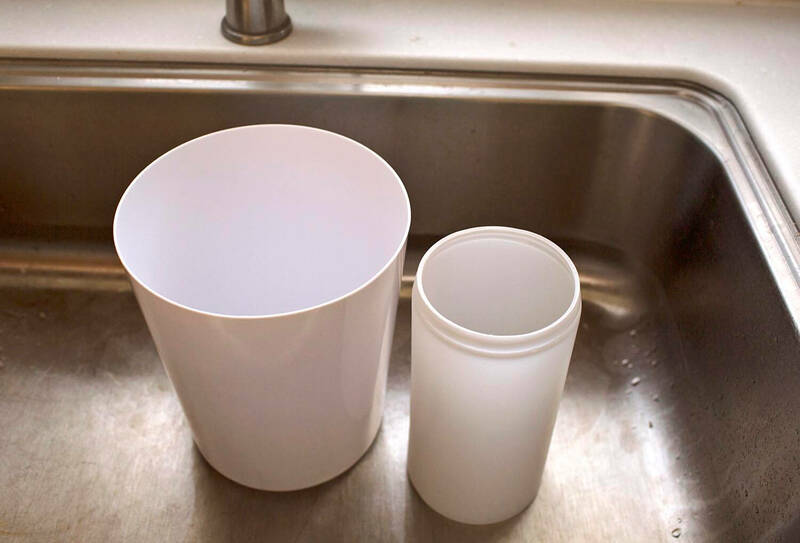 You want some space in between the bottom of the smaller container and the larger one, so that your final frozen bucket will have an ice bottom as well. So I added a few plastic pearls under so the water would flow and freeze around the entire inside container. You could use a number of things here though; I was just using some plastic white pearls throughout, so this worked well for me. 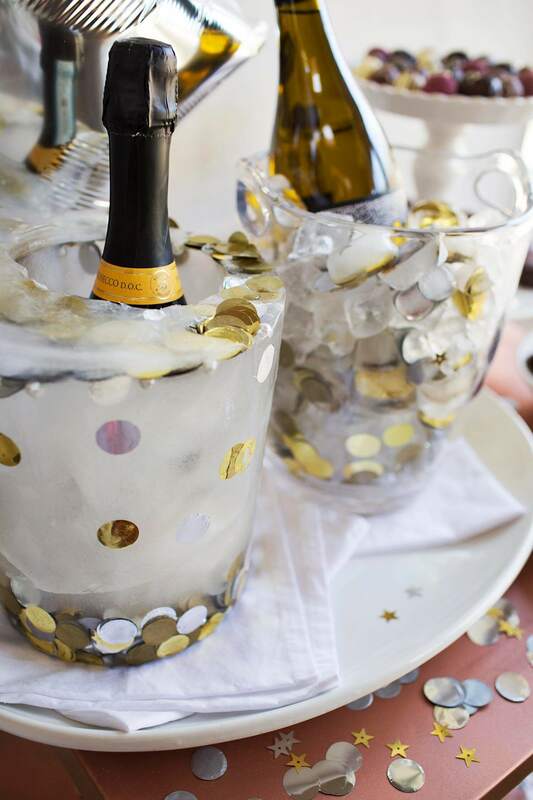 Fill the container with water and the confetti or whatever you plan to use in the look of your ice bucket. Keep in mind that water expands as it freezes so you can leave some space at the top. Place in your freezer and freeze overnight. 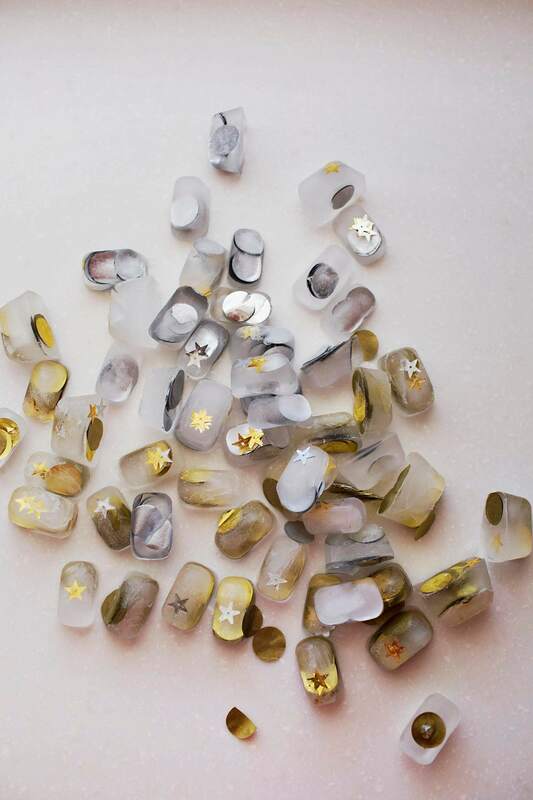 I froze my container in two layers so I could get more confetti throughout the final look, but this partly depends on what you use inside the water and if they float or settle or not. I also used very hot water (almost boiling) as I had hoped this would result in a more clear frozen ice bucket (as opposed to the cloudy ice look), but it didn’t seem to make a difference for me. So, up to you on that. When you’re ready to serve, run some warm water around the outside of the large container to loosen the ice bucket so you can remove it. Then pour very warm water into the inner container (over the rocks) so it will warm and loosen so you can remove it as well. Place on a serving dish with a lip as well as some white or matching fabric napkins (to soak up moisture as the bucket melts). 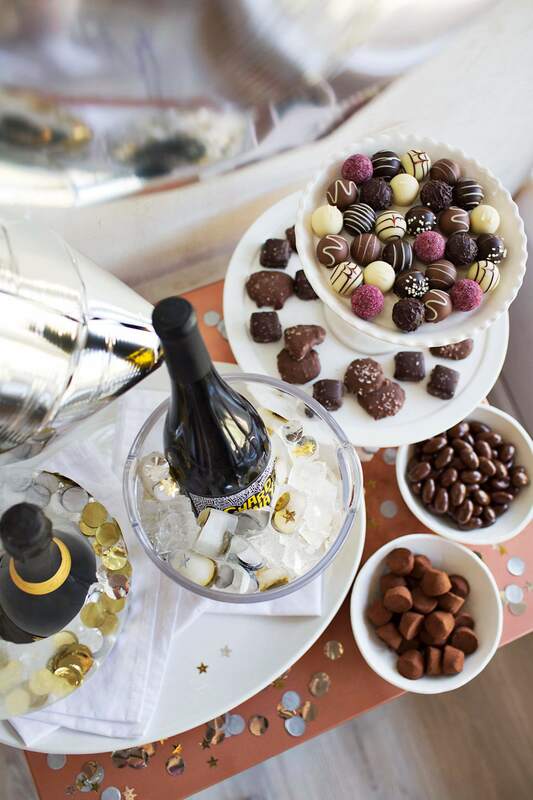 Add your chilled bottle and you’re party ready! How long does it last? This was the part I was very curious about, so I tested it to see. My bucket was about 1 inch to 1.5 inches thick and it held up pretty well for a little over six hours. I did have to drain water from the serving dish once, so it wouldn’t overflow. But I was impressed how long it lasted! 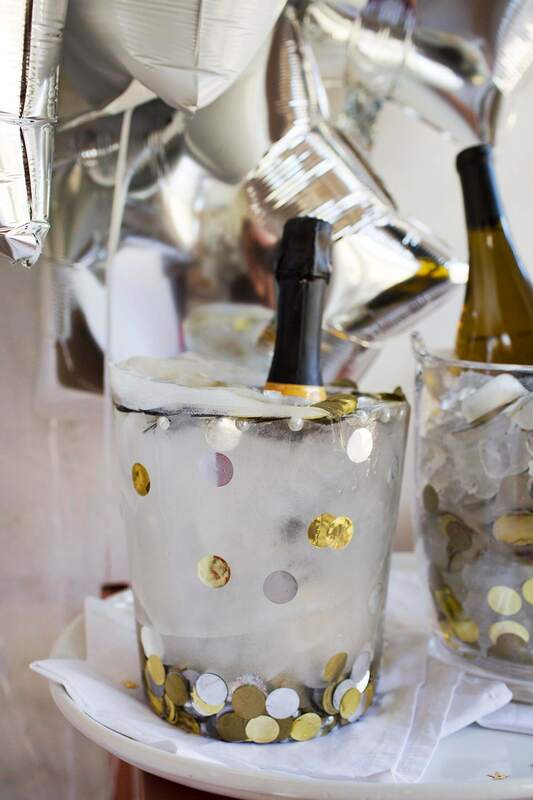 Another option is to freeze confetti or other cute objects in ice cubes and add them to a glass or acrylic ice bucket for a similar and super cute serving look. 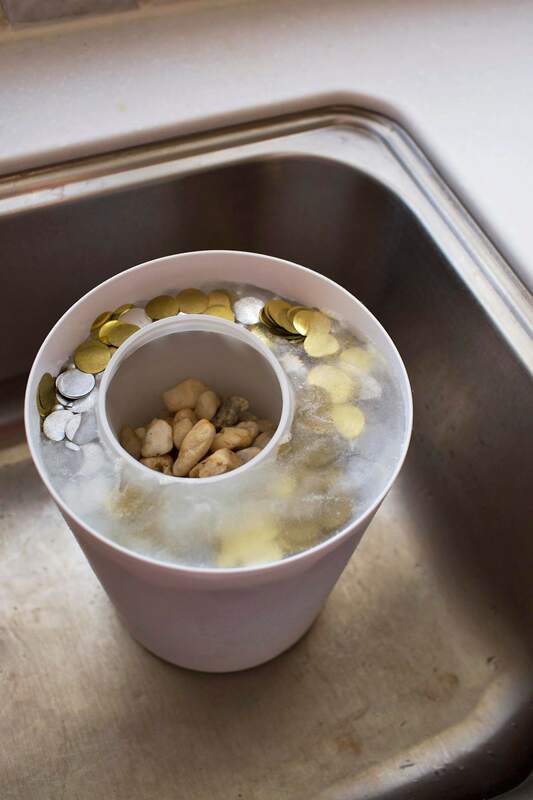 This option is even easier and a bit cleaner since the ice melts inside the container. 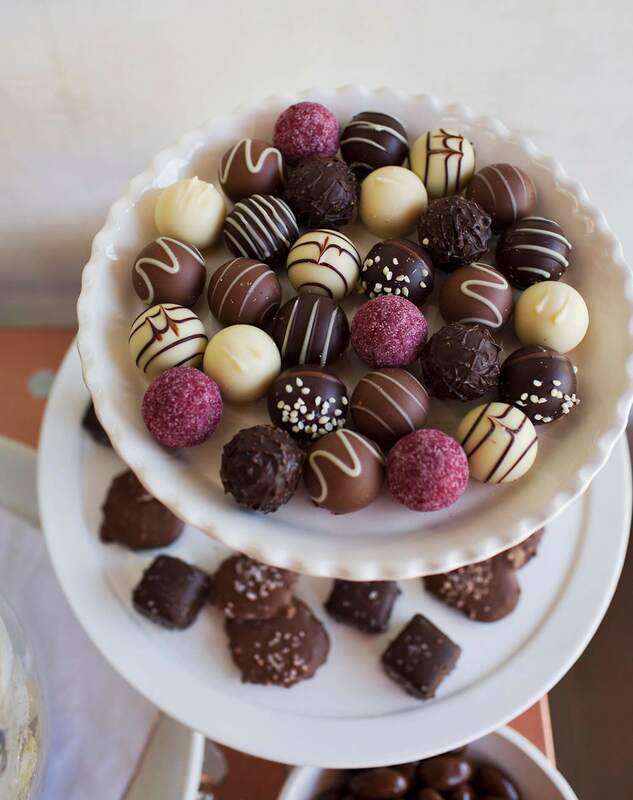 Can I just come over and eat all of those chocolates? I’m drooling. Ha! I would say yes but they are mostly gone now…. During the holidays I LIVE for snack bars and trays. I mean I would eat like that all the time but it feels way more festive in the month of December 🤗 such a cute idea…we always stay home with our kiddos and have a little party with them so it would be cute to do this with sparkling juice! Ah, they’re both cute! 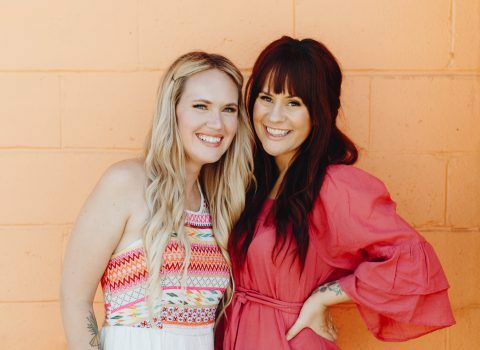 I like the combo here, too — they look cute together. Now I want to try this!! 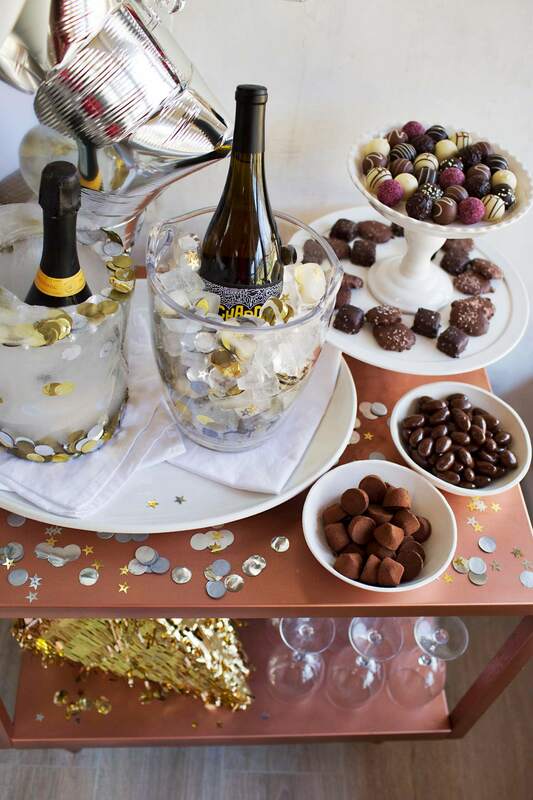 Love the idea with the ice bucket, and it looks soo cool with the confetti! Yummy! And a good idea! Woah, I’m craving that chocolate now! Looks cute and very festive!